St. George’s, Grenada ? Hurricane Ivan took aim Thursday at Jamaica and possibly Florida after killing 23 people in five countries and devastating Grenada, where police fired tear gas to stop a looting frenzy and frightened students armed themselves with knives and sticks. Ivan, the deadliest hurricane to hit the Caribbean in a decade, pummeled Grenada, Barbados and other southern islands on Tuesday. It weakened slightly and was downgraded from a Category 5 hurricane — the most powerful — to a Category 4 storm packing 150 mph winds but was still expected to pound Jamaica, where officials urged a half million people to evacuate coastal and flood-prone areas. Jamaican Prime Minister P.J. Patterson put security forces on alert against looting. “All of us are continuing to hope and pray that by some miracle we may at the last minute be spared the worst,” he said. But the U.S. National Hurricane Center said Ivan appeared headed for a direct hit on Jamaica today. The dead included a 75-year-old Canadian woman who drowned in a canal swollen by flood waters in Barbados after going out in the storm to search for her cat, and four youngsters in the capital of the Dominican Republic who were swept away by a giant wave Thursday even though the storm was nearly 200 miles from land. U.S. officials ordered people to evacuate the Florida Keys after forecasters said the storm — the fourth major hurricane of a busy Atlantic season — could hit the island chain by Sunday after crossing over Cuba. It was the third evacuation ordered there in a month, following Hurricane Charley and hard on the heels of Hurricane Frances. Officials were also considering evacuating the 1,000 American citizens in Grenada, mostly university students who said they wanted to leave. 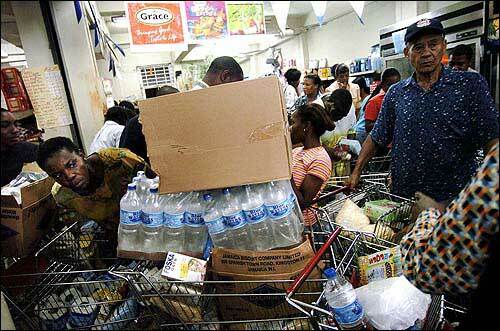 Shoppers wait in long lines to buy any food items remaining at the Maxim Market, in Kingston, Jamaica, as they prepare for Hurricane Ivan. The Category 4 storm was expected to pound Jamaica today. The storm left its worst damage in Grenada, where from the air it appeared that nearly every house had been ripped up. Hunks of twisted metal and splintered wood torn from homes were strewn across the hillsides and roads of this country of 100,000 people. Many trees were snapped off, and those left standing were stripped of their leaves. The stone walls of the capital’s cathedral withstood the storm, but the entire roof had caved in. In St. George’s, Grenada’s capital, police fired tear gas to try to stop a looting frenzy. Hundreds of people, including entire families with children, smashed hurricane shutters and shop windows to take televisions and shopping carts of food. An Associated Press reporter watched people walk away with bed frames and mattresses on their heads. Sixty soldiers from Barbados, Antigua and St. Kitts arrived to help restore order, military officials in Barbados said. Thursday afternoon, police set up barricades on roads leading into the capital and ordered all but emergency personnel off the streets.